I think you couldn’t find the names of the performers, either. 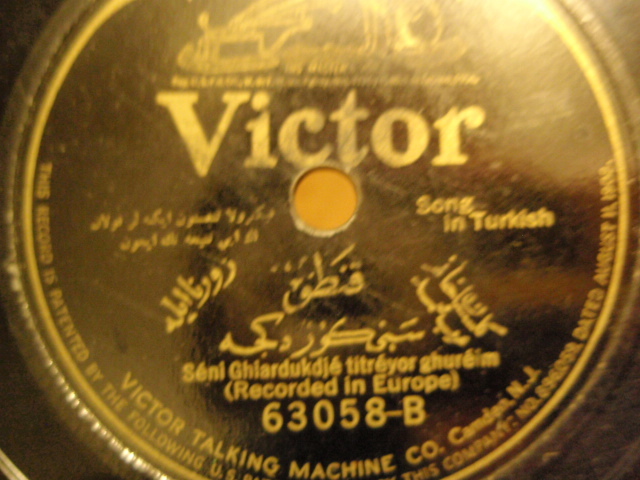 The title is written in English “seni gördükçe titriyor yüreğim”, and it is a love song. The song is a “kanto”, which was a kind of popular music of Istanbul. And the instrument is “zurna”, played by famous Arap Mehmet. One of the singers is Gülistan Hanım, a famous kanto singer of her time. Other singer’s name is not written. Maybe a better photo may provide more information, since the small Arabic letters are unreadable.